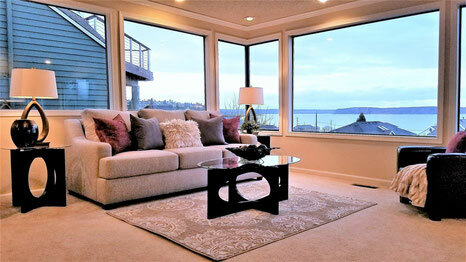 Old Town Tacoma Staging - Spaces Streamlined Home Staging, Styling and Organizing Gig Harbor, Tacoma and surrounding areas. Beautiful views can be appreciated from each floor and deck of this large home in desirable Old Town Tacoma. We staged with contemporary furnishings, leaving windows unobstructed in order for buyers to take in the magnificent views! For more information please contact George Pilant, Remax Professionals 253-988-6060.